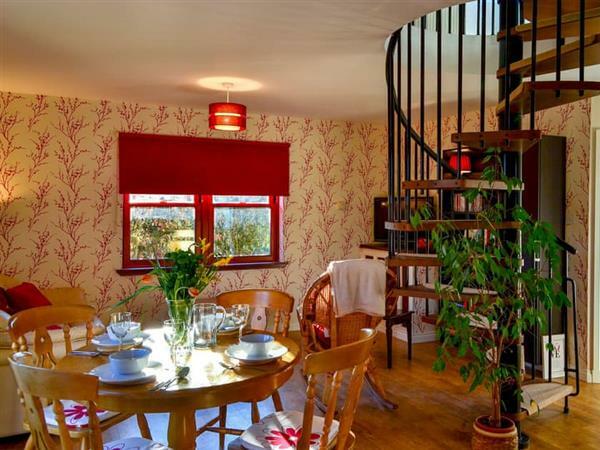 Greenknowe Cottage in Longnewton, near St Boswells, Scottish Borders sleeps 4 people. Greenknowe Cottage near St Boswells is just 7 miles from Melrose; set on the edge of the owner’s grounds, this detached cottage has a spacious, bright living area, a second sitting room with a tiny, but cosy wood burner and a bath/shower room for each of the bedrooms. The garden is enclosed and there is a small south facing patio area. Great care has been taken to provide the finishing touches which make a holiday memorable. There is a lot to discover locally, with the border abbey towns of Kelso, Jedburgh and Melrose close by; historic houses at Floors Castle, Mellerstain, Thirlestane Castle and Bowhill; lovely walks in the Eildon Hills or along the river Tweed; inexpensive golf on good local courses; fishing and cycling. Edinburgh is under an hour away by train from Tweedbank and there is a good range of independent shops, pubs and restaurants nearby. You will find the shop, pub and restaurant 3½ miles from Greenknowe Cottage near St Boswells. Kitchen/dining room: With electric oven, induction hob, microwave, fridge/freezer, dishwasher and Freeview TV. Bedroom 2: With double bed and en-suite with double-ended bath, toilet and heated towel rail. Oil central heating (underfloor on ground floor), electricity, bed linen, towels and Wi-Fi included. Initial fuel for wood burner included. Travel cot, highchair and stairgate available on request. Enclosed garden with patio, garden furniture and barbeque. Cycle store available on request. Private parking for 2 cars. No smoking. Holidays at Greenknowe Cottage run from Saturday to Saturday. Pets allowed at Greenknowe Cottage. For a better idea of where Greenknowe Cottage is, you can see Greenknowe Cottage on the map below. Greenknowe Cottage is in Roxburghshire; should you be on the lookout for a special offer, you can find all the special offers in Roxburghshire. It's always worth checking to see what is on offer at the moment. Do you want to holiday near Greenknowe Cottage (UK10434), you can see other cottages within 25 miles of Greenknowe Cottage; have a look to find your perfect holiday location.